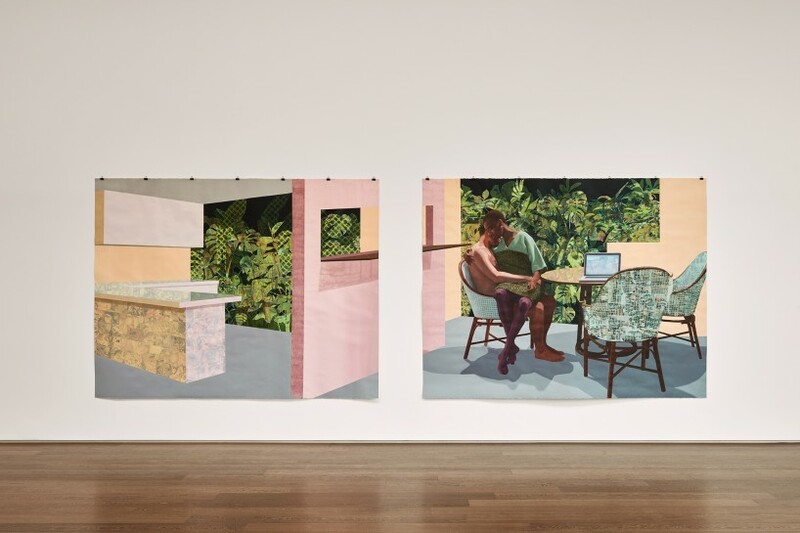 For the Nigerian-born, LA-based artist Njideka Akunyili Crosby, home is a lot of things. It is both the country of her birth, where she lived until she was 16 and where her family remains, and it is the place in which she now resides, bound to by her marriage to a white American. Her works on paper — domestic interiors peopled by family groups or quiet lovers, set against a fabric of richly symbolic collage elements — tell complex stories about transcultural identity and everyday life. They explore dislocation and diaspora, the way in which, she says, “immigrants occupy two places at once.” With luminous new works at Victoria Miro, her first solo show in the UK, the artist’s star is in the ascendant. In 2014, Tate acquired the diptych “Predecessors” (2013), and of the works in the exhibition, all are under £100,000 and for sale only to institutional collections. Chinua Achebe said that, “If you don’t like someone’s story, you write your own.” Achebe — along with the Nigerian writer Chimamanda Ngozi Adichie — is a touchstone for Akunyili Crosby, 33, who often borrows from literature for the titles of her works. (Her 2011 painting “Nyado: The Thing Around Her Neck”, references the writer’s 2009 short-story collection, The Thing Around Your Neck.) Like Ngozi Adichie, Akunyili Crosby has been called “Afropolitan”, a relatively recent label used to describe modern international Africans. But where the term has been criticised for being too general, Akunyili Crosby offers a strikingly nuanced portrait of black female experience.